This PDF 1.5 document has been generated by ILOVEPDF.COM, and has been sent on pdf-archive.com on 23/08/2015 at 15:00, from IP address 103.5.x.x. The current document download page has been viewed 309 times. File size: 329 KB (15 pages). Shockley receiving the Nobel Prize in 1956.
germanium provided functional structures despite the large dimensions of the early devices. and memory chips contain exclusively MOSFETs. choice for cell phone amplifiers and other demanding applications. technology and bipolar power devices completes this chapter. involves both types of mobile carriers, electrons and holes. Electron and hole flow under forward active bias, VBE &gt; 0 and VBC = 0.
applied to the base contact relative to the emitter and collector respectively. arrow, and the base-emitter depletion layer recombination current, Ir,d, (not shown). Figure 5.2.2. : Energy band diagram of a bipolar transistor biased in the forward active mode. current, IE,p and the base-emitter depletion layer recombination current, Ir,d. 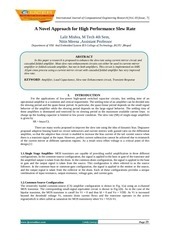 Ir,B and the base-emitter depletion layer recombination current, Ir,d. can therefore become much larger than one. the sum of the electron and hole current diffusing across the base-emitter junction, IE,n + IE,p. collector, to the current due to electrons injected in the base. of 0.99, a base transport factor of 0.995 and a depletion layer recombination factor of 0.998. Field Effect Transistor a &quot;VOLTAGE&quot; operated device. replace their equivalent bipolar junction transistors (BJT) cousins. integrated circuits such as the CMOS range of digital logic chips. FET's as there are also two basic classifications of Field Effect Transistor, called the Nchannel FET and the P-channel FET. correspond in function to the Collector and the Emitter respectively of the bipolar transistor. device that depends only on the conduction of electrons (N-channel) or holes (P-channel). Field Effect Transistor or MOSFET for short. either end commonly called the Drain and the Source respectively. compared to their P-channel counterparts. junction field effect transistor and a bipolar junction transistor are compared below. within the channel and whose width increases with the bias. BJT is always some value greater than zero. applied (i.e. the depletion region has near zero width). Drain to the Source restricted only by the small depletion region around the junctions. closes is called the &quot;pinch-off voltage&quot;, ( VP ). This file has been shared by a user of PDF Archive. Document ID: 00297342.